It’s that time again – Blogger CLUE is here and this month, I was given Kate’s Kitchen as the blog and the theme was fall fruit. Well, I took that to mean any fall fruit and I chose tomato – tomato soup to be exact. Kate is a financial planner who is married to man name Connie and his three children and now they have grandchildren – all these things we have in common although Mr. Picky Eater is the finance man and not me. Kate and Connie are Colts and Red Sox fans as well as being very well traveled and civic minded. They just moved into a new home and in general seem to be living a lovely life in Indiana. I knew most people would be making apple, pear and persimmon recipes and Kate has many of those recipes but I had something else in mind – mostly because I was being a bit selfish! Tomatoes are considered a fruit and I love fall tomatoes. They taste better to me than early summer ones. I suppose it is because their flavor is so concentrated but whatever the reason, I love them. This year has been a horrible growing season because it rained far too much and then continued to rain stressing the plants and causing most of the tomatoes to split. Saturday at the Farmer’s Market we found these two lovely ladies who had larger cherry tomatoes and my very favorite yellow tomatoes. Since they looked and smelled spectacular so we purchased them. I paid a fortune for them but still, I really wanted to have one nice tomato sandwich this year and so far, hadn’t had any good enough. Luckily the Farmer’s Market ladies had a big box full of yellow tomatoes. Mom is still convalescing so we had several of our favorite versions of the tomato sandwich and put them on some salads as well. 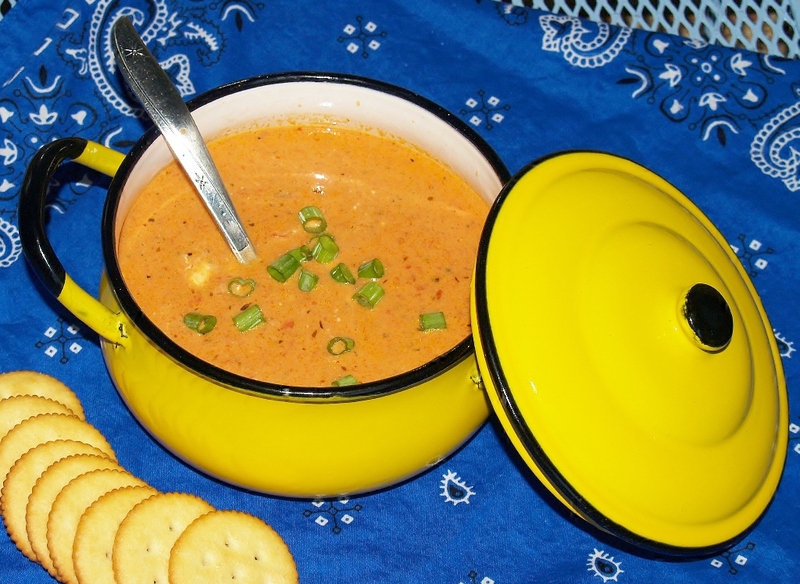 With what was left, I made Pat King’s Tomato Soup. I loved reading the post because it recalled the day she met Liz from That Skinny Can Bake and Christiane from Taking on Magazines. There weren’t a lot of directions so I winged it and made it my own. 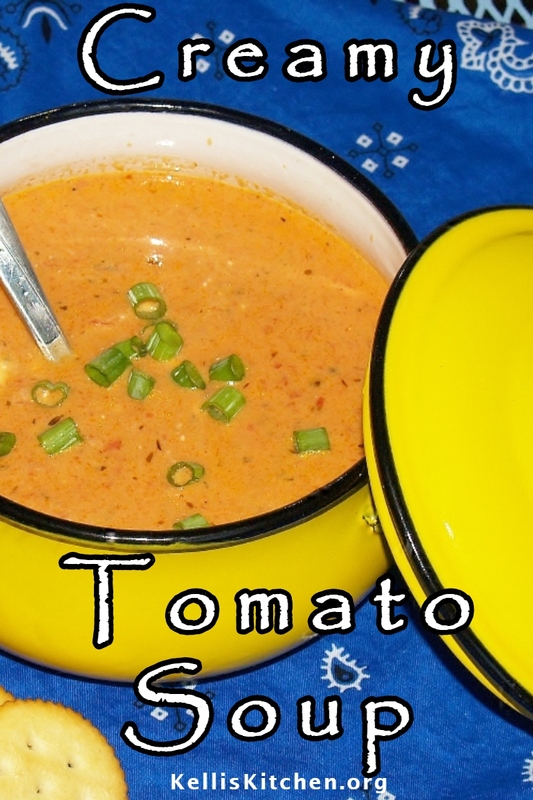 You can find the original Chunky Tomato Soup recipe here. 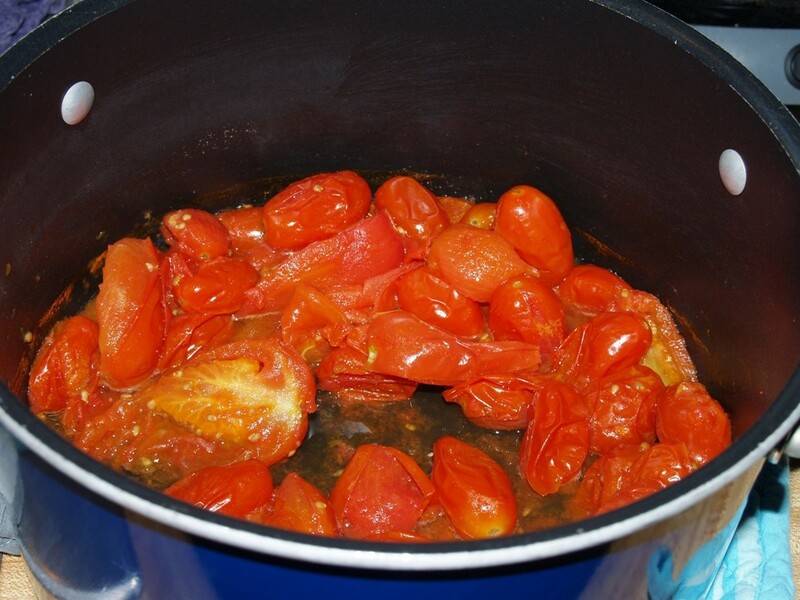 Wash and quarter the tomatoes, put into a big pot and cover bottom of pot with water – simmer the tomatoes until they are tender, about 15 minutes. 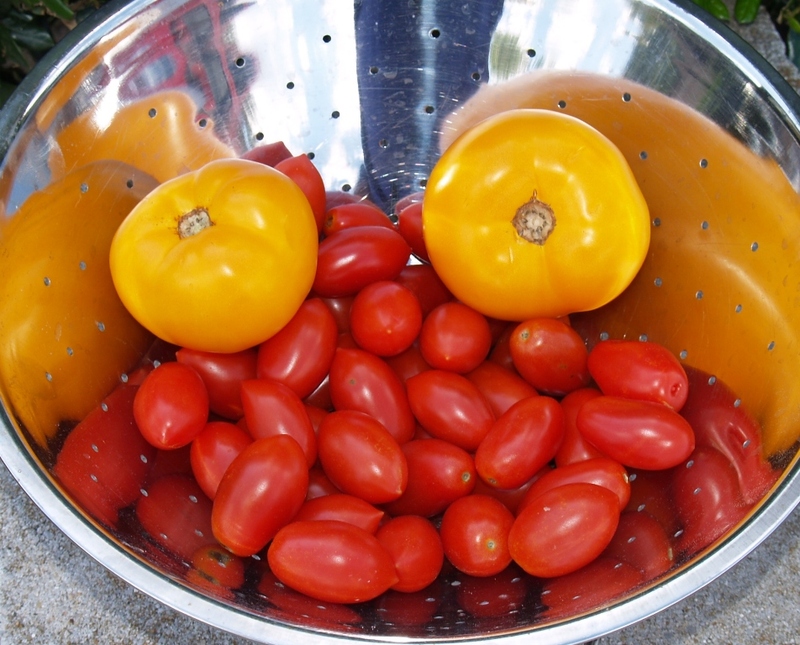 Send tomatoes and juice through the food mill which will catch all the seeds and peels – this is a very smooth creamy tomato soup. Roughly chop the carrots, celery, onion and garlic then process through the food processor. Put olive oil into a big Dutch oven and heat then add the finely processed veggies until soft then add in the milled tomatoes as well as the chicken broth, oregano, parsley, salt and pepper. Simmer for a few hours and then when you turn the burner off, stir in a cup of heavy cream. Kate said it was best served the next day so that’s just what we did – and it was delicious! I hope you will take a moment to check out all the great recipes this month from blogger CLUE – I can’t wait to see who got me and what recipe they made! Oooh, so creamy and delicious!!! 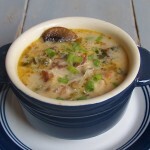 This is Katie’s favorite soup and I haven’t found one that she loves as much as what I can buy (you know that’s a challenge for me to make the perfect recipe!). So now I must try Kate’s recipe—Katie prefers hers without basil so this is perfect! Thank you Liz – it was very good and it freezes well too! Tomato Soup is always a favorite with us. Great choice! 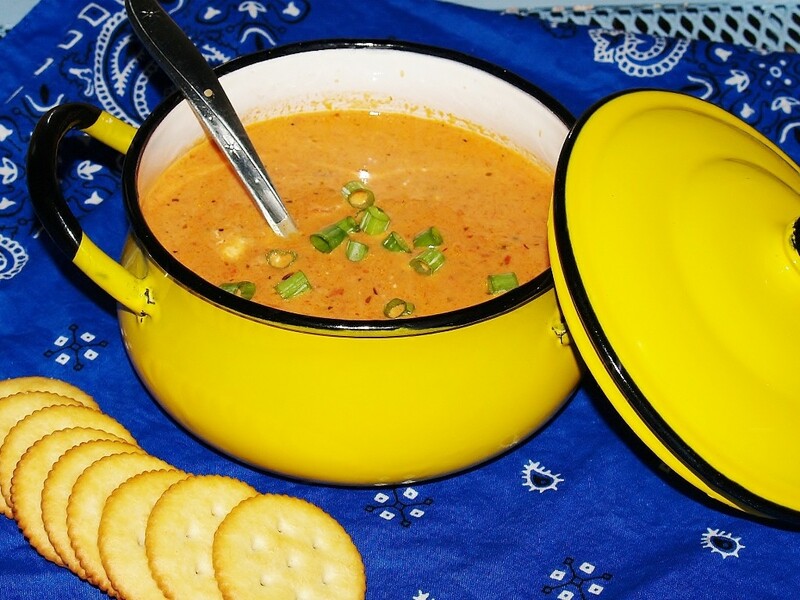 I have my hopes set on fall tomatoes…then I will definitely make this soup! 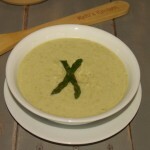 What a beautiful soup for the upcoming fall season! My mouth is watering. Nice choice! Hooray for adding a savory recipe to the mix this month! I love me some cakes and tarts but am always on the lookout for a good dinner recipe, and this soup definitely fits the bill! Our garden tomatoes were also disappointing this year. We’re just starting to get some edible tomatoes now and this would be a good recipe for using them. I agree with Wendy. …..tomato soup with the apple and brie panini! I remember that soup well and it was delicious! Though Kate’s soup looked a LOT different than what you came up with. I don’t remember it being creamy but very tomato-ey. In any event, I’m glad you got to know Kate a little more this month. She’s an awesome lady. 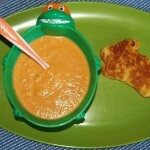 My kids just love tomato soup and creamy tomato is the way they like it. Yours looks great and it’s so wonderful for cooler temps. Great selection for this month! Oh!! This soup looks simply amazing. My family loves tomato soups and our markets are still flooded with tomatoes. My husband was requesting tomato soup the other day. This soup sounds like a hearty version that’s perfect for welcoming fall. Kelli, I don’t think you need to add any water at the beginning of cooking the tomatoes. 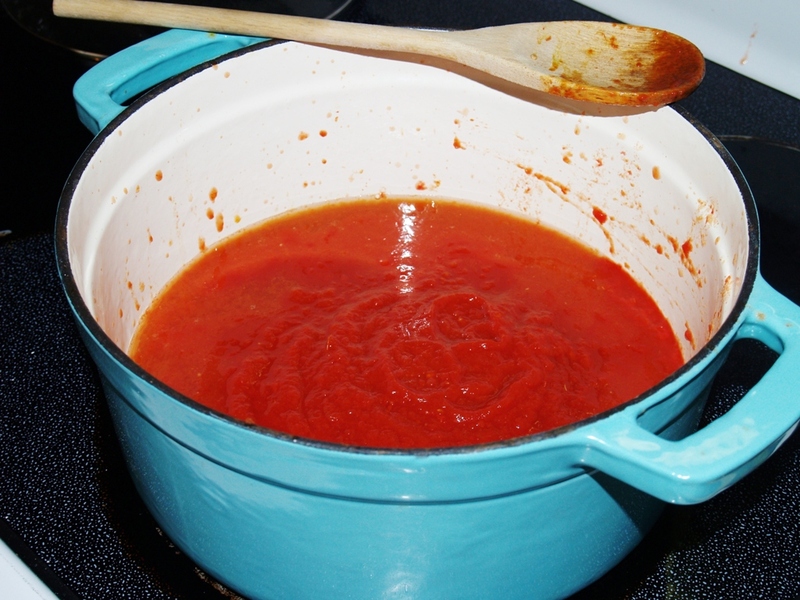 Out tomatoes are juicy enough that the bottom of the pan had more than enough liquid. 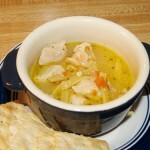 We really loved this soup and I froze some of it for a couple of those c-o-l-d nights we’ll have here in a few months. Great job! Thank you.